Despite increasing political tensions and evolving trade policies, the U.S. M&A market in 2018 enjoyed its second-best total deal value ever, according to Mergermarket. Activity through the first three quarters appeared poised for a new record, before slowing in the final quarter as stock market volatility spiked and questions arose about the direction of economic growth. 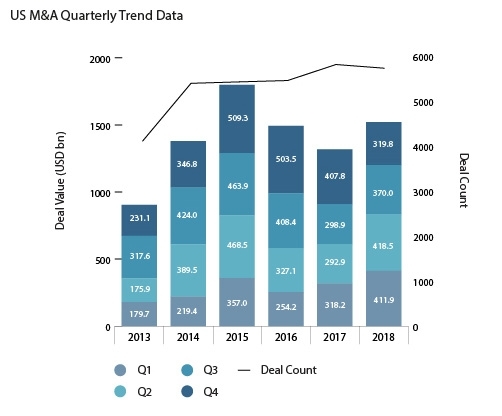 Tech M&A continued to boom, reaching $574 billion in deal value globally – just short of 2015’s record of $577 billion – with private equity (PE) contributing a quarter of every dollar spent in tech M&A in 2018, according to 451 Research’s M&A KnowledgeBase. Healthcare M&A shared center stage in 2018, with megadeals including Takeda’s $77 billion takeover of drugmaker Shire and health insurer Cigna’s $71 billion acquisition of Express Scripts. The action has continued into 2019 with Bristol-Myers agreeing to buy Celgene for $74 billion and Eli Lilly agreeing to buy Loxo Oncology for $8 billion. Cross-border dealmaking remained strong, with the number of deals falling slightly from 2017 but remaining above the levels of other recent years. Dealmaking between the U.S. and China continued to decline, with inbound value falling to just under $3 billion in 2018 from $8.7 billion in 2017 (and a record $55.3 billion in 2016). Meanwhile, Chinese bids in Europe in 2018 rose 81.7%, to $60.4 billion). Prospects for 2019 remain strong, with companies eager for growth and capital still abundant and relatively cheap, despite the Federal Reserve’s recent moves away from its low interest policy. However, there are risks that could slow M&A activity. In this alert, we review some of the key trends and developments arising from last year’s M&A activity, and consider how they might affect the level of M&A and how deals are done going forward. Learn more about Morrison & Foerster’s Global M&A Practice. Many aspects of 2017’s Tax Cuts and Jobs Act (TCJA) remain to be refined in the coming year (or even years). However, several trends emerged during 2018 and tax savings will continue to be a source of potential value in 2019. Potential for 100% tangible asset expensing – Newly proposed regulations may affect the ability to obtain these benefits. In particular, potential traps exist in relation to related party transactions and prior use limitations. Limitations on net operating losses (NOLs) and interest deductions – The new limitations have substantially complicated deal negotiations and financing considerations. For example, in the case of NOLs, sellers are no longer able to carryback current year extraordinary deal expenses that might generate a tax refund in respect of a prior tax year (such as option cancellation payments), and must instead try to get compensated for forward-looking benefits. Interest expense limitations – Buyers must maintain sophisticated financial models in order to track the interest limitations, which have increased administrative burdens for heavily leveraged taxpayers. International provisions, including deemed repatriation of previously untaxed foreign earnings – Several new reps and covenants have emerged in deal documentation, including covenants regarding compliance with the deemed repatriation rules and related tax obligations. The continued availability of the Section 1202 exclusion for “qualified small business stock” and the reorganization provisions under Section 368. Tech companies have generally not been able to obtain the benefits of the 100% expensing in connection with asset acquisitions, given that qualifying assets generally include only tangible asset classes and do not include goodwill or other types of intangible assets. Highly leveraged industries and industries with substantial overseas manufacturing or other foreign operations have faced materially higher compliance burdens and planning issues as compared with those of other market participants. 2. U.S.-Trade Trade Tensions and National Security Concerns Move the Goalposts…. As we predicted last year, U.S. national security concerns and the Committee on Foreign Investment in the United States (CFIUS) played a major role in cross-border transactions for both strategic buyers and PE sponsors. Trade tensions with China, increasing market volatility, and new legislation and regulations are impacting whether and how cross-border deals are structured and getting done. Clarifying when investment funds with foreign limited partners would be subject to CFIUS jurisdiction. Most of the changes implemented by FIRRMA will become effective once CFIUS issues implementing regulations, expected late this year. However, the U.S. Department of Treasury (as the CFIUS chair) published interim rules implementing the critical technologies “pilot program” contemplated by FIRRMA that imposes a mandatory declaration filing requirement, with penalties for failure to file equal to the value of the transaction. The pilot program covers “critical technologies” developed for use in one of 27 industries, including pharmaceuticals, biotechnology, and battery manufacturing in addition to those more traditionally associated with national security concerns, such as semiconductors. The definition of “critical technologies” includes items subject to export control restrictions, but also “emerging and foundational technologies.” In November 2018, The Department of Commerce’s Bureau of Industry and Security issued an Advance Notice of Proposed Rulemaking identifying 14 categories of “emerging technologies” and requesting public comments on the categories identified and appropriate definitions. As expected, the Commerce Department's list includes artificial intelligence, robotics, and 3D printing among the emerging technologies that will be covered by the CFIUS pilot program (and also subject to export control licensing requirements). These regulatory challenges are expected to impact PE sponsors, including those with foreign LPs as well as those based outside the U.S. Asset managers generally have been increasing allocations to private equity, and sovereign wealth funds have been ramping up direct investment activity, especially in U.S. technology companies. Given the voluminous dry powder in the PE industry, as noted elsewhere in this alert, PE sponsors are expected to challenge (or even surpass) strategic technology acquirers in closing acquisitions in the technology sector, which has emerged as the hottest industry vertical for PE investment. Consequently, PE sponsors and backers of other private investment vehicles will need to be especially mindful of the new regulations. Dealmakers will need to follow the CFIUS regulations as they continue to roll out, and carefully coordinate the timing and terms of their transactions around national security concerns to the extent the deals involve foreign investment. These changes have already begun to result in process changes for deals, including targeted front-end diligence for all parties involved to answer the threshold question of whether they are looking at a covered transaction and whether a declaration is required. Despite these concerns, the U.S. market continues to attract significant investment interest from abroad, and while the regulatory landscape continues to evolve, deals continue to be done. 2018 was a strong year for the private equity industry. Available capital was at an all-time high, and 2018 deal volume for PE buyers exceeded record levels. 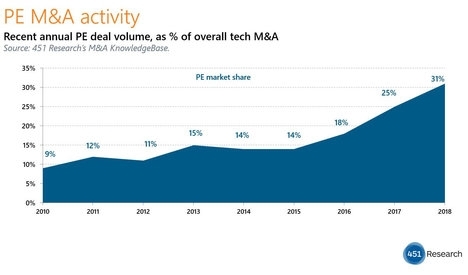 Tech transactions dominated PE activity, as they have for the past couple of years, headlined by Vista Equity Partners’ acquisition of Apptio and KKR’s acquisition of BMC Software. PE firms engaged in as many tech deals as did more traditional tech strategic acquirers, with some PE firms taking advantage of potential synergies with existing portfolio companies and some PE firms buying earlier stage companies lacking the stronger cash flows of more traditional PE targets. The healthcare sector saw increased focus from PE firms, as exemplified by KKR’s acquisition of Envision Healthcare, the acquisition of Athenahealth by Veritas Capital and Evergreen Coast Capital, and the acquisition of LifePoint Health by a consortium composed of Apollo Global Management, ATP Private Equity Partners and RCCH Healthcare Partners. PE firms increased their activity in the $1 billion + M&A market, and in club deals among mega-funds and sector-specialist funds. Sponsors also partnered with strategic investors, as in the acquisition by Humana, TPG Capital and Welsh, Carson of Kindred At Home (with a put/call option giving Humana the right over time to buy the rest of Kindred At Home) and Curo Health Services. Financial sponsors remain nimble and attractive buyers, and the increased fundraising over the past few years has allowed more active PE participation at all levels of the market, from mega deals to smaller deals. Dry powder now eclipses $1 trillion by some estimates. The trends noted above should continue into 2019, along with an increase in take-private transactions. That being said, the outsized returns that have been delivered by PE funds over the past decade are at risk as sellers’ expectations and corresponding prices have continued to rise. Creativity will be imperative, as PE funds seek value-enhancement strategies to differentiate themselves in a crowded field. PE funds will also need to be mindful of broader market trends, noted elsewhere in this alert. While the threat of a general economic slowdown lingers, available capital and creative investment strategies, particularly with respect to assets that may become distressed in any such slowdown, should continue to drive an active PE market throughout 2019. Until the Delaware Chancery Court’s decision in Akorn v. Fresenius on October 1, 2018, no Delaware court had found a material adverse effect (an MAE) that justified the termination of a merger transaction. Year-over-year second quarter and full year revenue declined 29% and 27%, operating income declined by 84% and 134%, and earnings per share declined by 96% and 170%. Vice Chancellor Laster also estimated a 21% reduction in value from the deal price based on the costs and effects of the company’s myriad regulatory violations. The court also raised questions about the extent to which such a downturn must be “unexpected,” rather than allowing the parties to allocate the risk contractually, and drew attention to the interplay between the differing levels of materiality that often apply in different reps and covenants. In a pre-Akorn world, the inclusion of an MAE qualifier comforted many targets when agreeing to expansive reps and warranties or preparing disclosure schedules. Now that a Delaware court has found an MAE and has emphasized the importance of contractual risk allocation, targets may require more guidance to understand the practical implications of including an MAE qualifier in their merger agreements for their specific businesses. For example, as there is still no bright-line rule, disclosure schedule preparation may become a more time-consuming task as targets are less willing to rely upon an MAE qualifier as their primary protection. Targets should be cautious, however, when balancing the legal instinct to over disclose in the schedules against business considerations, as over disclosure could potentially have a chilling effect on the deal (for example, by implying that less significant items could rise to the level of an MAE or that problems lurk from myriad potential causes). In addition, targets and buyers are also likely to spend more time thinking about the need (mostly from the target’s perspective) for specific carveouts to an MAE definition and targets could also find themselves focusing on these issues with respect to a buyer when accepting stock as the form of payment. Although recent transaction documents already show evidence of parties being influenced by Akorn, one occurrence of an MAE does not a trend make. The threshold for an MAE is still high. The outcome of Channel Medsystems Inc. v. Boston Scientific Corp., which will decide the validity of another buyer terminating a deal due to an MAE, may give Delaware courts another chance to decide whether Akorn is an anomaly or the first of many more MAEs to come. One trend that continues to reshape the M&A market is the participation of “non-tech” companies as major buyers in the technology market. 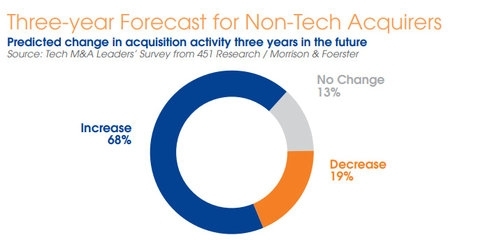 According to 451 Research, strategic acquirers from outside the tech market have now spent more than $40 billion on tech M&A in each of the last three years. Prior to that period, according to 451 Research, non-tech acquirers never spent more than $35 billion in any single year following the dotcom bubble of 1995 to 2001. And deal-makers anticipate this trend will continue, with 68% of respondents to MoFo’s October 2018 Tech M&A Leaders’ Survey predicting an increase over the next three years in non-tech companies acquiring tech companies. The shift correlates with the increasingly blurred lines between what is considered a “technology” and a “non-technology” business, as connectivity, automation, mobility and data have permeated the business world and traditional non-tech companies are now utilizing technology in order to solve internal gaps or enhance external offerings. The speed at which technology disruptors can enter and reinvent a targeted market has also added pressure on non-tech companies to develop their tech arsenal at a rapid pace or risk losing ground. Oftentimes this means acquiring an established technology business rather than attempting to internally develop a digital platform. Combining tech and non-tech companies can require both sides to learn more about each other. For example, a non-tech company will need to spend time on diligencing, or learning how to diligence, the source and scope of the intangible assets that underlie most tech companies. They will also need to consider how to motivate and retain a workforce that may be focused on equity incentives. Target companies will want to know that their non-tech suitor will understand (and hopefully pay for) the scalable value they think they represent, and will do what’s appropriate to retain the workforce needed to continue developing the technology. Privacy and data issues continued to gain prominence in 2018, as new laws required companies to adopt new compliance procedures and exercise increased vigilance and the risk of the occurrence and costs of breaches continued to increase. The EU’s New GDPR. Nearly all companies felt the impact of the new EU General Data Protection Regulation (GDPR), which overhauled EU data protection laws and grabbed headlines with its new penalty provisions of up to €20 million or 4% of global worldwide turnover (whichever is more). GDPR not only set new rules for companies operating in the EU, but extended these obligations to companies operating outside of the EU that target or monitor individuals in the EU. In the M&A context, GDPR has become a key priority in privacy-related due diligence, particularly of data-driven businesses, whether B2C or B2B. California’s Upcoming CCPA. In the wake of GDPR, a California ballot initiative triggered a landmark new privacy law. This law, California’s Consumer Privacy Act of 2018 (CCPA), creates unprecedented new privacy rights, such as giving California residents the right to view personal information that a company maintains about them. Significantly, CCPA also creates a new private right of action for consumers affected by data security breaches, which compounds the risks that may arise from acquiring a target company that, knowingly or unknowingly, has experienced a data security breach. CCPA takes effect on January 1, 2020, and has added urgency to discussions of the possibility of Congress adopting a federal data privacy law. Increasing Data-Driven Business Models. The growing focus on privacy and data protection in M&A deals is driven not only by changes in laws, but also by the growing importance of data-driven business models. When a target’s business model is fueled by user data, privacy and data protection are integral to the risks and rewards of the deal. As the risks and requirements grew, and the portion of businesses that were implicated expanded, buyers expanded their diligence investigations. Buyers also have taken care to conduct diligence in compliance with the new rules and exercised additional caution in requesting and handling personal information. In acquisition agreements, buyers have expanded reps and warranties and, in some cases, specific indemnities. For the longer term, buyers have also increased their attention to data-related integration issues. 2018 was a milestone year for changing privacy laws, but 2019 promises to be at least as groundbreaking. M&A dealmakers will need to keep pace with the changing privacy landscape, especially for tech-driven and data-driven deals. Activist campaigns hit a record pace in 2018, with 226 companies targeted by shareholder activists, up from 188 in 2017. The U.S. remained the focus, but activism also expanded abroad, particularly in Europe and Asia Pacific. M&A is typically one of the most commonly announced objectives for activists, occurring with about the same frequency as demand for board changes. Activists also push for other M&A-related objectives, such as divestitures, and other capital allocation steps, such as dividends and buybacks. The most common objective is to push the targeted company to sell, accounting for more than 41% of M&A-related campaigns in 2018. For example, TV-ratings producer Nielsen Holdings reportedly faced an activist campaign in the summer of 2018 from Elliott Management, which had accumulated an 8% stake and was encouraging a full company sale. At the beginning of 2019, Starboard Value announced that it had accumulated a 1.7% stake in Dollar Tree and suggested that it consider a sale or other strategic alternative of the Family Dollar business acquired in 2015. Challenging, or seeking to change the terms of, announced deals is also a common theme, involving about 30% of M&A-driven campaigns in 2018. Such is the case with Alps Electric’s proposed acquisition of Alpine Electronics, a deal which involved both Elliott Management and Hong Kong-based Oasis Management. The number of activists has also continued to grow. 131 activists were responsible for campaigns in 2018, up from 108 in 2017. Despite that growth, a small number of activists accounted for a large percentage of activity, with Elliott Management alone accounting for 9% of campaigns. Boards contending with activists in an M&A setting need to keep in mind their legal duties within the company’s overall context, as well as the demands of activists and the apparent wishes of their shareholders. Courts have generally been reluctant to apply greater scrutiny to board decisions merely because they are made under threat of a proxy contest, but when combined with other facts relevant to the company, or to the sales process, other shareholders may complain that directors have failed to comply with their duties to make their own decisions. As 2019 begins, activism is not expected to recede in any meaningful way. Directors will need to be prepared and remain engaged with their shareholders and act in accordance with their duties when faced with activist pressure. Delaware courts in 2018 continued the trend in appraisal cases towards reliance on the negotiated deal price as an indicator of a target company’s fair value. This bodes well for buyers whose transactions fit within the requirements for such reliance, since it reduces the chances that they will be required after closing to pay a higher price to stockholders seeking appraisal. The Delaware Supreme Court has refrained from setting a “bright line” rule requiring reliance on deal price. However, in its 2017 decisions in DFC and Dell it emphasized that a deal price set through “an open process, informed by robust public information, and easy access to deeper, non-public information” “deserved heavy, if not dispositive weight.” Deals that do not follow such a process, particularly where significant conflicts are involved, on the other hand, could end up with the court calculating a different fair value. The trend seems to be playing out in the incidence of appraisal litigation as well: In 2017, the number of appraisal cases filed in Delaware declined to 62, from 85 in 2016, and in 2018 the number dropped even further, with roughly 30 appraisal cases filed in Delaware. The changing landscape has also resulted (in our experience) in more modest settlements in existing litigation. In Verition Partners Master Fund Ltd. v. Aruba Networks, Inc., the unaffected market price (about 30% lower than the deal price) won the day on fair value. Although the court deviated from the deal price, noting the need to account for synergies and agency costs, the court explained that the absence of exploitation in the process indicated that the deal price was reliable. The court highlighted several factors reflecting a non-exploitative process: a third party deal negotiated at arm’s-length; the lack of a controlling stockholder; no stockholders receiving preferential treatment; no conflicts of interest by the target’s ultimate decision makers; and nothing untoward in the standard deal terms (in other words, nothing that would support a breach of fiduciary duty claim). A go-shop that, among other things, was subject to a relatively short time period and provided information and unlimited matching rights to the initial buyer. The ineffective go-shop was particularly problematic because without a pre-signing market check, it was the only opportunity for the target to test the market. Dealmakers continue to watch for signals from the Delaware courts, including the anticipated ruling in the ongoing appeal of the Aruba decision noted above. Rep and warranty insurance has been used by PE buyers for several years, but it is still used by just a fraction of strategic acquirers. The prevailing theory for the difference is that strategic acquirers can leverage deal synergies to justify higher valuations than their PE competitors, and as such their proposals are viewed as attractive despite the increased escrow and indemnity obligations that accompanied their bids. More recently, however, some strategic acquirers have become more comfortable with the idea of deal protections through representation and warranty insurance. This willingness by some strategic acquirers to compete on both value (taking account of strategic synergies) and escrow/indemnity terms will put pressure on other strategic buyers to get comfortable with rep and warranty insurance in order to remain competitive. Premiums tend to cost between 2% and 4% of the coverage amount. Buyers and sellers negotiate who pays the premium, although it is almost always the buyer that procures the policy. Retention (deductible) amounts are most often around 1% to 1.5% and equally allocated between the buyer and the seller, although both of these terms are also negotiable. In competitive bid situations, some buyers opt for smaller retention amounts that the buyer covers entirely, although this comes with some increase to the premium. Survival periods for representations tend to be at least three years, which is longer than a customary survival period under market indemnity terms absent insurance. Coverage by rep and warranty insurance continues to be limited to unscheduled and unknown breaches. Buyers thus continue to explore other mechanisms, such as specific indemnities (or, in some cases, other kinds of insurance), to address issues disclosed by sellers or otherwise known to buyers. See Mergermarket’s Global & Regional M&A Report 2018. See generally our Client Alert from Jan. 2018. See our 8 Key M&A Trends in 2018. See our Sept. 2018 Client Alert discussing FIRRMA. See our Oct. 2018 Client Alert discussing the pilot program and list of critical technology categories. Read our Nov. 2018 Client Alert discussing the Commerce Department notice. Commerce Department notices with respect to “foundational technologies” will be issued separately. See our Client Alerts on the Chancery Court decision from October 2018 and the Supreme Court’s affirmation in December 2018. See Financier Worldwide, Tech-Led M&A. For a wealth of information and resources about GDPR, please visit MoFo’s GDPR Readiness Center. For information and updates on CCPA, please visit MoFo’s California Consumer Privacy Act Resource Center. See our article, Five Key Legal Risks for Data-Centric Technology M&A. See 2017 Activism Year in Review, Lazard, Jan. 2018. For examples, see In re Tangoe, Inc. Stockholders Lit’n, Del. Ch. Nov. 20, 2018; In re PLX Technology Inc. Stockholders Lit’n, Del. Ch. Oct. 16, 2018. See our Client Alert from Dec. 2017. See Shareholder Litigation Involving Acquisitions of Public Companies: Review of 2017 M&A Litigation, Cornerstone Research (2018). Includes quasi-appraisal claims as well as appraisal claims. See our Client Alert from Feb. 2018. See our Client Alert from Aug. 2018.